The work on the manuscript catalogue of Christ Church, Oxford is drawing close to its completion. Small finds, however, are still being made and it is one of those I want to share with you. It involves MS. 486, the sole surviving complete witness to William Gager’s tragedy, Dido. It is very fitting that it should reside in Christ Church for not only was it written by Gager while he was a student at the foundation but its first performance took place in its Great Hall on 12th June 1583. That performance was a lavish occasion, intended to impress a visiting Polish prince, in the presence of the University’s chancellor, Robert Dudley, earl of Leicester; both Philip Sidney and Giordano Bruno were probably in the audience. Yet, the close connexion of the manuscript’s content with Christ Church does not mean that it has continuously been resident in the House, as its members call it, since its production: it only arrived in the last decades of the nineteenth century, having been purchased at an Edinburgh book-seller’s. This has allowed speculation over its origins. 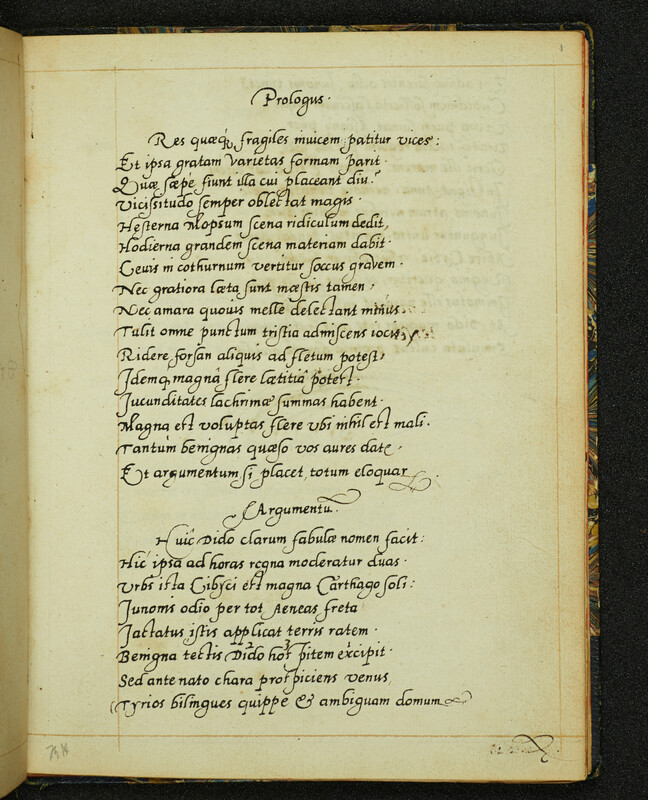 The historian of sixteenth-century university drama, Frederick Boas, was impressed by the elegance of its presentation – there is no illumination but it is written in an italic book-hand with frequent pen-flourishing – and surmised it was a ‘fair copy’ of the play probably produced for one of the distinguished members of the audience at its performance. That led others to go further and suggest that the little codex is in the hand of the playwright himself, but J. W. Binns, who edited the tragedy and who, more generally, has done so much to enrich our understanding of early modern English learned literary culture, suggested that attribution ‘may be open to doubt’. He does not expand on that comment but I assume that what he had in mind was the contrast between MS. 486 and the secretary script on display in Gager’s autograph notebook, now in the British Library as MS. Add. 22,583. More recently, another lion of early modern literary studies, Dana Sutton (and writing his name reminds me I owe him a response on another matter), re-edited the play in his edition of Gager’s complete works – which, with characteristic generosity of spirit, he has made freely available on-line. In his work, Sutton expresses confidence that the hand penning MS. 486 is, indeed, that of the author, but others have not been fully convinced. The recent catalogue of British Drama displays some caution saying at one point that it is ‘probably’ holograph and, at another, down-grading that to ‘possibly’. It is my contention, having spent time in both Christ Church and the British Library, that the hesitation is unnecessary – what follows vindicates Sutton’s identification and suggests also that we can, in all likelihood, take the date of writing to be close to that of the play’s performance. You will also notice from this image one codicological feature – the handwriting is even but on an unruled page, with the only ruling being the single bounding line on each side, forming a rectangle in which the text-block sits. What a photograph like this cannot reveal is that there is also a distinctive watermark in the paper. It is not fully legible and does not appear in the standard compilations of watermark sbut its central motif is a pair of weights, with a flower above and a horizontal scroll below, apparently reading ‘LAMAIN’. Watermarks, even when we can be sure of their place and date of production, can only give us a terminus ante quem non for their use, but what, it occurred to me, this watermark might do is prove the manuscript’s proximity to Christ Church if we could show that other volumes produced there used the same paperstock. It was with that in mind that I checked the Disbursement Books where Gager’s signature appears, but they are on paper (as they record, supplied by the Oxford stationer and binder, Richard Garbrand) which regularly have a water-jug or ‘pot’ watermark. There is, however, another manuscript which is of identical paperstock to MS. 486 – and that is Gager’s notebook. Furthermore, that notebook, which includes parts of the Dido and, a few pages later, has notes dated to September 1583, has the same pattern of ruling as MS. 486. In other words, Gager had a sheaf of paper from the same stock and prepared in the same manner, some of which he used in the eventful year of 1583 for his own drafts and some for the ‘fair copy’ of his tragedy. Not only does this confirm the identification of him as the scribe of both, but it makes it highly likely that MS. 486 was, indeed, written in Christ Church around the time that the stately tragedy was being performed on a temporary stage erected in the Hall. I should emphasise the limits of our evidence: the codicological details do not absolutely demonstrate a precise date of use of the paper for MS. 486; all they can do is provide suggestive evidence. I will also admit a slight scepticism about Boas’s suggestion that the copy was made for one of the guests at the performance: if it were, it was notably understated, without any attempt at coloured decoration; and, if it were, it has survived remarkably well, with no marks of ownership or damage from use. It is perhaps more likely that it was kept safe – perhaps by the author himself. The lesson, in conclusion, that I would like to draw is not a new one and should be familiar to any scholar of manuscripts and their contents: if we are to eke out of what sits before us all possible information, we have to take account of every detail, however insignificant it may at first appear. As I have said before, the law may not care de minimis, but we must do.